It’s always smart to protect your investment. Depending on the temperature, Spring, Summer and Fall are the ideal times to improve the look of a fence. Here at Wyman Painting™, count on us – your Omaha Fence Staining Contractor – to transform the old – to new again with exceptional Omaha pressure washing services and superior Omaha deck/fence staining. Your fence can really add a lot of value to your home, but if it looks run down and fading, it might actually hurt your curb value. We offer pressure washing services to clean your fence of old stain, debris, and dirt. Then we can stain it again and make it look amazing! We offer many color choices to give you a chance to make your fence have your own style. Remember that we can do any fence of any size. 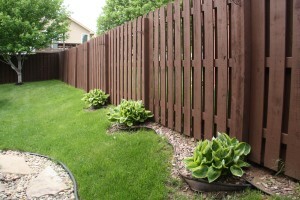 We are professional at everything we do and we take great pride in your professional fence staining Omaha services. Call us today to learn more about our fence staining services and all of our other services such as deck staining and painting. We look forward to helping you make your home look beautiful. Not only will a fresh coat of stain for your fence add dramatically to the value of your home, but it will also make it look great. Houses with dingy, rundown fences closing in the yards tend to give off a foreboding, unpleasant vibe. You want your home to look inviting and cheerful. While you may not think that it makes much of a difference, the condition of your fence can say a lot about the rest of your home. It is most likely one of the first things people see when they look at your house. If you want your home to make a good first impression on visitors and potential buyers, start by updating your fence. Staining your fence can improve the curb appeal significantly. Instead of a drab, boring fence, you will now have a fence that looks clean and polished. Before the fence can be stained, however, it needs to be power washed and sanded so that it is free of dirt and has a smooth, consistent texture. Once the fence has dried, the fun begins – stain can now be applied! You can match the color of your home, go with a neutral tone, or stain the fence a contrasting color to give your home a bold look. Wyman Painting offers stain in a wide variety of colors to help you achieve just the right look for your home. In addition to improving the curb appeal of your entire home, staining your fence will also improve and preserve the functionality of the fence. Quality stain will prevent the wood from fading, and will protect the fence from moisture – which could lead to mold, mildew, and warping. To give your home a facelift, contact Wyman Painting today and learn more about our fence staining services. Call owner Chris Wyman direct (402) 319-3956. 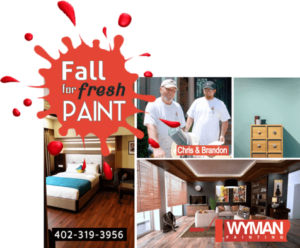 Wyman Painting is your trusted Omaha deck/fence staining source!